What is a dress form and how is it different than a mannequin? A dress form is created with a layer of foam and cloth (or jersey, as it is sometimes called) on top of its inner shell. The reason for this is that the dress form saw its beginnings in the service of tailors. These craftsmen would use the dress form to build a dress - or any article of clothing - around. During which, they would need to stick pins through the fabric and into the form to hold the fabric in place. This is the reason for the layer of foam in the dress form. The additional layer of cloth is just for aesthetics (and to hold the foam in place). 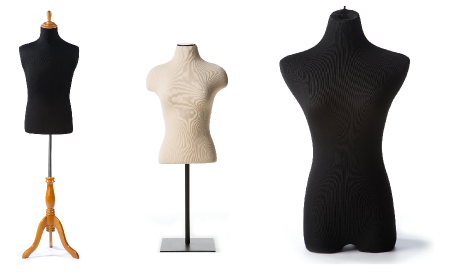 On the other hand, a mannequin is primarily made of a hard material such as fiberglass, plastic, or even metal. They are created with no intention of any sewing application. They are purely designed to display clothing. 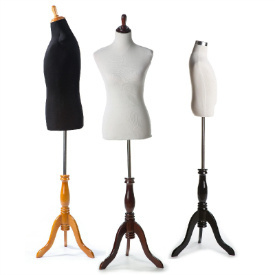 There is a common misconception that dress forms have no head or limbs while mannequins do. 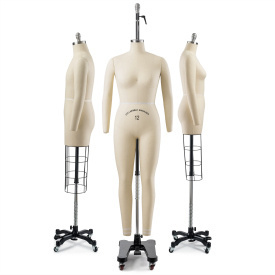 In fact, as shown below, there are many dress forms with limbs and many mannequins without them. To illustrate the difference between the mannequin and the dress form, we have compiled a random assortment of each for comparison purposes. Below are several types of dress forms. What is a dress form used for? Well, the dress form is still widely used by tailors/ seamstresses worldwide - who, we've notice, comprise a large portion of our dress form buyers. In the olden days, the tailors were the apparel retailers and they used to showcase their newly made clothing on the same forms which they had made them with. Over time, much of the clothing manufacturing was moved to the larger factories whom were not in the business retailing the clothes to the actual consumers. However, the clothing retailers who bought the clothes from the factories continued showcasing their apparel on these dress forms. Nowadays, the dress forms have such an elegant look that a huge number of retailers still choose to use them over real mannequins. A quick stroll through any mall will reveal that over half the retailers still choose to use the dress form for its classic and elegant look. 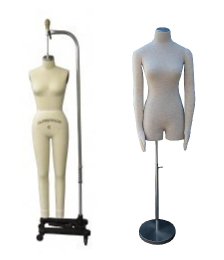 The classic dressform is created with attention to its appearance, and is therefore used by both clothing retailers and tailors/ seamstresses. 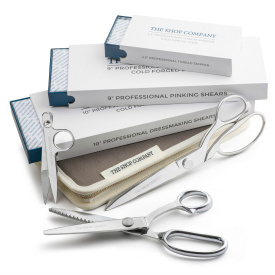 Professional dress forms, on the other hand, are designed purely for the tailors and are therefore used exclusively by them. Partially pinnable or fully pinnable? Our partially pinnable models have a thin layer of foam between its fiberglass shell and its jersey exterior. The fully pinnable models have a much thicker and harder layer of foam. Both can be used with pins, only the fully pinnable models take pins straight in while the partially pinnable models can only take pins inserted sideways (see our illustration below). A side effect from this difference is that while the partially pinnables are quite strong, the fully pinnable models are stronger and tougher. If the clothes you plan in displaying (or creating) are VERY heavy, it might be a better idea to go with the fully pinnables. Currently, all of our floor standing dressforms are partially pinnable while our tabletops are fully pinnable. There is also another important difference between the fully and partially pinnable (completely arbitrary though) - please see below. 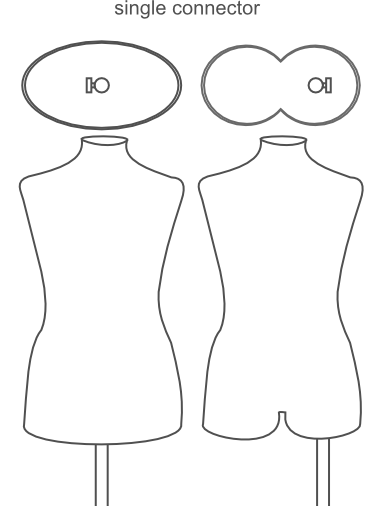 Unrelated to the their pinnability, there is another difference between the fully pinnable and partially pinnable dress forms - single or dual connectors. A connector is the area where the pole from the base connects with the actual dress form torso. The partially pinnable models come with two connectors on the bottom of their torsos, one in the center and the other off to the left. 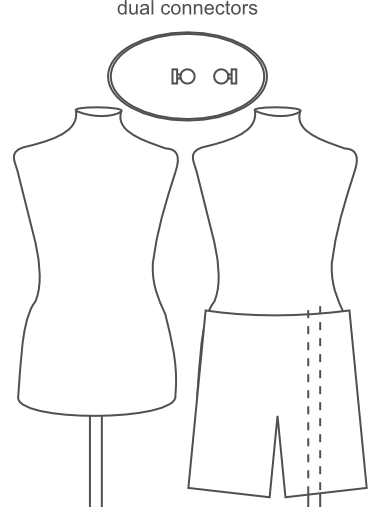 This allows for the dress form to be displayed with trousers (see the first illustration below). The fully pinnables only have a single connector, either in the middle (all the flat bottom models) or in the left leg (all the crotch-bottomed torsos), as shown in the second illustration below. Please note that due to the added weight of our professional forms, none of the professional forms have the dual connectors.